I love picture book biographies. The regular biographies, when well done, can be fantastic books, but let’s be honest here – sometimes they can be a bit dry and boring. I can’t do dry and boring. Picture book biographies, on the other hand, usually offer a really cool spin on certain aspects of a subject’s life, with awesome pictures. This one, The Fantastic Undersea Life of Jacques Cousteau, is exactly that. This book is about the marine scientist/inventor/television pioneer – Jacques Cousteau, and it skips all the boring stuff that puts you to sleep and just gets to the really interesting parts of Cousteau’s life. First, that he was very sick and weak as a kid, but used water to strengthen his muscles, starting a life long love affair with the sea. Second, that a chance gift of some goggles, started him on a quest to explore deeper and deeper and deeper in the world’s oceans, forcing him to invent equipment that no one thought possible to reach his goals. Then, the desire he had to share what he was seeing under the sea and creating undersea cameras so that TV shows could be filmed, showing the whole world what he was seeing. Finally, Cousteau’s desire to protect the oceans from mankind, who had polluted everywhere else in the world already. In just 32 pages, Dan Yaccarino touches on all those aspects of Cousteau’s amazing life, leaving some readers with just enough information, but sending others (like me) right to Wikipedia to read more and to YouTube to watch Cousteau’s videos. That’s the sign of a good book right there. This one was recommended to me by some teachers I talk to on Twitter, and I’ll be passing the recommendation on to any kids who have any interest in sea exploration or marine biology. This summer, I’ve been on a quest to finish 90 books in the 90 days we have off from school. This book was #78. I love baseball. What’s great about baseball is all the personalities, all the quirks, all the rich moments of history. There’s so much there, and so much of it is woven into the fabric of American society from the mid 1800s to the 1960s and 1970s when baseball started to become more business than sport, more about money than being America’s past time. One of the things I love most about the game is the fun stories that are hidden away. Every player, more so than football and basketball in my mind, has their own story to tell. Two of my favorites are Roberto Clemente and Larry Doby. Clemente, by Willie Perdomo, is one of those books that shows you how some players were bigger than the game. Roberto Clemente was the first Latin American superstar in baseball. His story mirrors Jackie Robinson’s in many ways, and this book shows one of the most important – that he was a hero to other people, that he showed them that a Puerto Rican kid could grow up to be rich and famous, and that a hero is more than just someone who runs around a ballfield for a living. Clemente was a hero in every sense of the word. As a ballplayer, he did represent hope to a segment of society that had none of their own to root for. However, off the field he was a true hero, giving his time, his money, and his life to help people who weren’t as fortunate as he was. This book looks at Clemente through the eyes of a young fan who idolized the Pirates outfielder for all of those reasons. 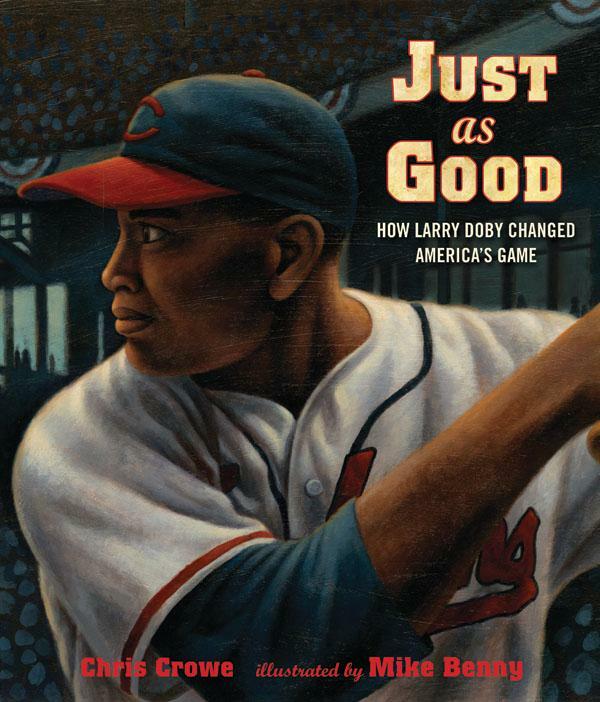 Just as Good by Chris Crowe is the story of Larry Doby. Who? That’s what you’re probably asking, but Larry Doby was an African American player – the second ever to make it to the big leagues, the first in the American League, and the first to win a World Series ring. He was just as good as Jackie Robinson, but Robinson gets all the glory. 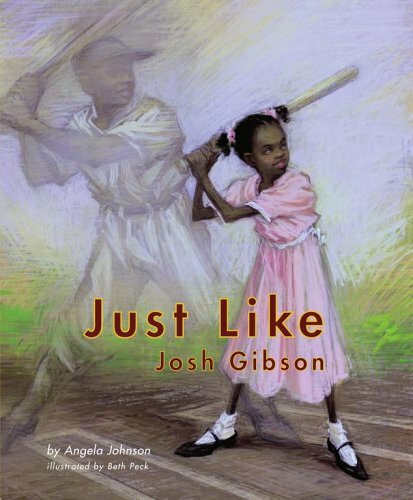 Doby, who is also in the Hall of Fame, gets the star treatment in this picture book, and the author makes the case for Doby’s success was even more important for black athletes than Robinson’s was. This story, also told through the eyes of a young fan, shows the impact Doby’s career had on young African Americans. Unfortunately, Doby is a sometimes forgotten player in our history, but Crowe does everything he can to undo that for his readers. These are the kind of books I love before heading on a road trip to see a ball game in Pittsburgh or Cleveland with my boys. To look at a statue of Clemente or Doby is one thing, but to know their story is so much more meaningful. Clemente was the 76th book I read this summer, and Just as Good was the 84th. I’m getting close to finishing my quest for reading 90 books in 90 days over break. Ever since we got a tiny paperback copy of Doreen Cronin’s Wiggle in our Cheerio’s a few years ago, we’ve been big fans. It’s hard to top Wiggle in our hearts, but Cronin has several fantastic series of children’s picture books, all of which entertain my kids to no end. My second favorite of her books is Click, Clack, Moo – Cows that Type. This is the first in a fun series of books about Farmer Brown and the mischievous animals on his farm – especially the class farm clown, Duck. Duck is at it again in Giggle, Giggle, Quack – another farms story in which Farmer Brown dares to go on vacation and leave his unsuspecting brother in charge. Duck takes full advantage of the situation, pulling some strings to get the farm animals pizza for dinner and a movie night in the barn. My boys loved it. 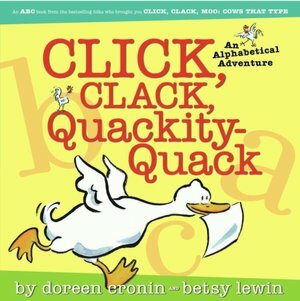 Clickety Clack, Quackity Quack is a fun ABC book that stars Duck and the farm animals. 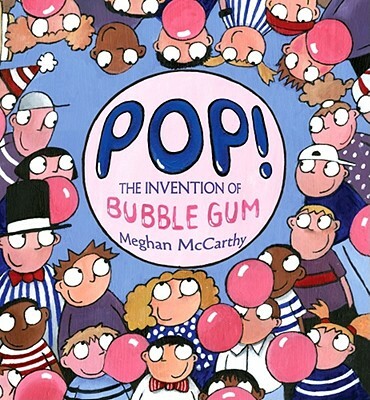 It’s a clever introduction to the ABCs and Cronin’s cast of characters. Thump, Quack, Moo is another farm adventure, loaded with fun onomatopoeia in which Duck and the other animals “help” farmer brown prepare for the annual corn maze on the farm. Duck, as you’d guess if you’ve read any of the other books, has got his own agenda – this time he’s out to alter Farmer Brown’s Statue of Liberty corn maze design to be a little Duckier. All three of these books, and any of the Duck stories, are illustrated by Betsy Lewin with fun, cartoony pictures that perfectly match the characters and stories Cronin creates. All of them are highly recommended. Cronin’s other “series” is even more fun for the little kids. It starts with Wiggle. Which I would estimate I’ve read 6,000 times in the last 5 years. We love Wiggle. The book is about a cartoon dog who wiggles a lot. He wiggles when he wakes up, he wiggles out of bed, if he wiggles with his breakfast, it might wind up on his head… See, I’ve read it a lot – I just typed those lines from the book without looking them up. Even though we own two copies of Wiggle – the little paper one from the cereal box and a hardcover copy we bought last year, the boys still wanted to check it out. They love acting out all the wiggles in Wiggle, so it was a no-brainer to check out Stretch and Bounce, which feature the same dog, illustrated by Scott Menchin with a variety of styles. The other two books are more of the same kind of fun – the dog bouncing and stretching through all sorts of places and with tons of funny animals. I’m sure as soon as these two need to be returned to the library, I’ll be looking for our own copies on Amazon or at a local bookstore. I can’t recommend these books enough for families with little kids. I’m on a quest to read 90 books in 90 days this summer. These six Doreen Cronin books were #59, 60, 61, 62, 63, and 64. Potty training is not fun. It’s frustrating. It’s messy. It involves far more laundry that I want to do. I honestly thought that potty training the twins would be easier than it was when it was only one kid. I thought for sure that two little boys would get competitive about who would, could, should poop and pee on the potty. I thought giving them little prizes like Skittles or M&Ms would make it even easier. There’s not any competition. They don’t care about what the other is doing. There’s no desire to get out of diapers. They don’t seem to care that they are expensive. They’ve gotten really good at teamwork when it comes to climbing the counters and getting down the bag of Skittles so that they can have a treat when ever they want it. Now I have to get creative when I hide the candy. It’s in my sock drawer now. If you ever come over, now you know where I keep my Skittles. This week my wife picked out How to Potty Train Your Monster by Kelly DiPucchio from the local library. I read it, next she’s going to read it, then this weekend it’s going to be a potty boot camp at our house. This book breaks potty training down into simple steps like getting your monster a potty chair, dressing your monster in easy-off clothes so they can get into potty mode quickly, and washing your monster’s paws after potty time. It’s a cute book. Honestly, it does a really good job of giving a fun voice to a boring set of instructions, and the illustrations by Michael Moon are pretty darn funny. I’d highly recommend this one to any parents working on potty training their kids, big brothers or sisters who want to help out, or anyone who’s ready to get out of diapers. How to Potty Train Your Monster was the 58th book I read this summer. I’m on a mission to finish 90 books in 90 days over break, and I’m almost two-thirds of the way there.